Calling all 4th and 5th Graders! 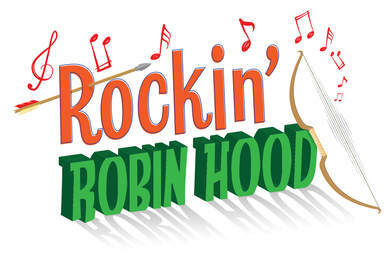 Nottingham rocks in this exciting take on the legend of Robin Hood! A young orphan Robin and his twin sister Hazel arrive with big hopes to open an archery shop, but immediately run into trouble. King Richard has recently left for the Crusades, so the rotten Sheriff of Nottingham and his avaricious fiancé, Lady Blackwood, seize the opportunity to tax the town blind. Robin quickly makes an enemy of the sheriff and eventually becomes a wanted man... an outlaw! By the time he escapes to Sherwood Forest, he’s met all his legendary friends — Friar Tuck, Little John, Marian, and more — and brought the team together to help return what is stolen from the poor and eventually bring the evil sheriff down. * Parents must attend one of the upcoming parent information meetings . Parents who are unable to attend either meeting must notify producers prior to the meetings.